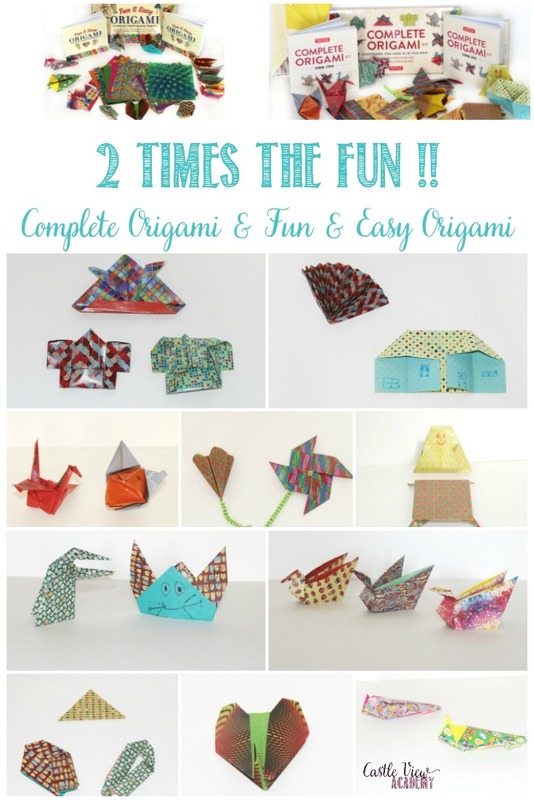 Home » Culture » Asia » Two Times The Fun With These Origami Kits! 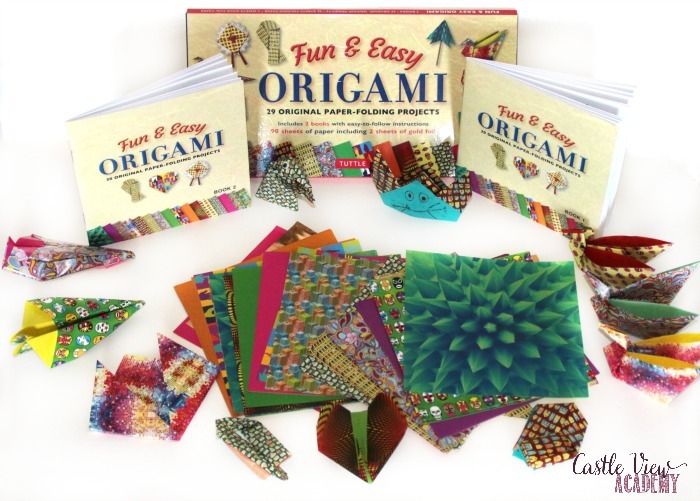 Two Times The Fun With These Origami Kits! The weather here is becoming much cooler and the forecast is that we’re to have the coldest winter in five years! This means we may not go out quite as often as slippery walking can be tricky up and down a hill; so what can the kids do while they’re indoors? 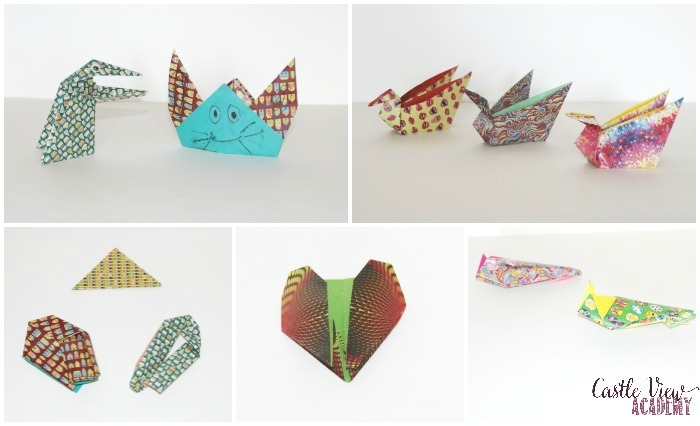 Reading is great, but we also need to challenge their brains…so let’s get out the origami (which counts as math, you know!) and have some creative fun. This post contains affiliate links through which I may earn a small commission. Tuttle Publishing kindly sent over these two origami kits for the kids to use, and they’ve been having fun with them (although I only have Kallista photographed here, Tristan did indeed join us but he tended to work while I was busy doing other things…like writing up blog posts). 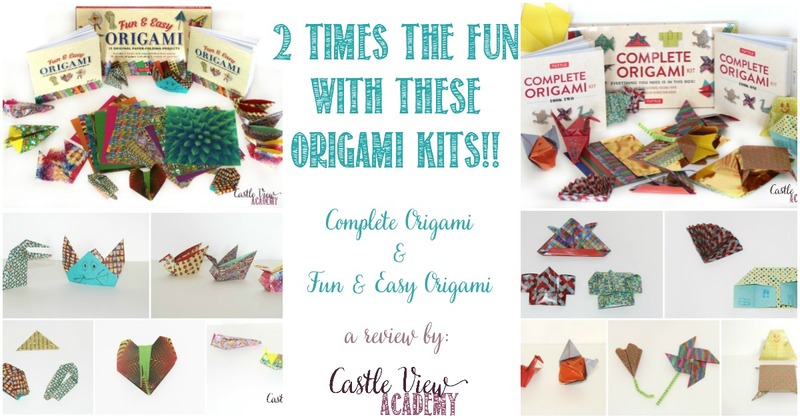 Let me tell you all about these two fun origami kits that are great for kids. The one on the top left is a hungry bird, and its mouth really does move! Tristan added some wiggly eyes to it to make it more fun! The top right are 3 bird party baskets; this was Kallista’s favourite project! She made many more that she has given away and also placed around the house. The back opens up a bit into two little pouches into which you could place small candies for a party. The heart at the bottom Tristan gave to me with a message of love written inside, awww, I love my son, too! 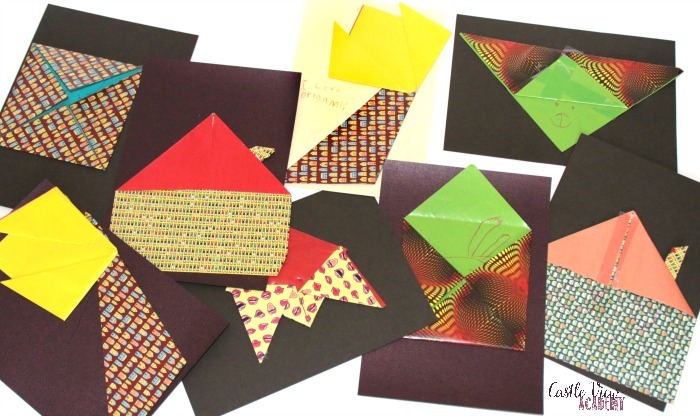 Remember back to high school and folding papers into different shapes and passing messages in class? That’s just what those are, secret messages. Tristan also had fun with them….one afternoon he took a stool outside my window and used a dino grabber on a stick to stretch up to through the bedroom window and drop his message inside to me! Tristan also liked to make the paper airplanes. A couple of the other projects included are a wind toy, treasure box, mask, cat finger puppet (also shown above), and the kids had a great time learning the coin trick (the triangle shown in the collage above)! 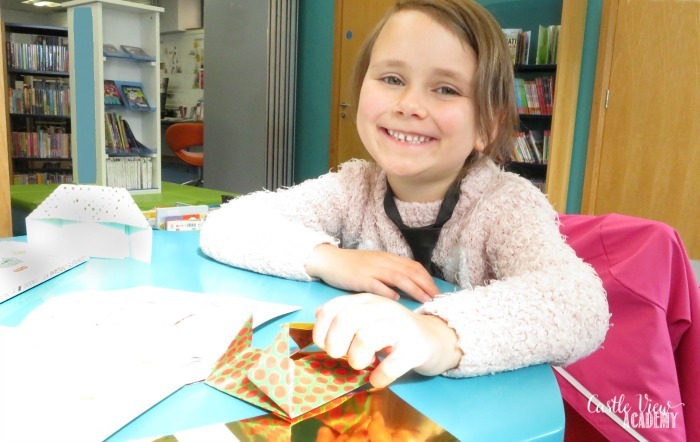 The Fun & Easy Origami Kit certainly kept us all busy and the addition of a magic trick as well, was fantastic! In the top left is the helmet that Tristan made which goes well with the kimono that Kallista and I folded. In the top right is my little fan creating a breeze for Kallista’s super-simple house that anyone can fold. In the bottom left is a crane whose wings and tail have been decorated, and a sly fox puppet. In the centre is a flower (the basic pattern can be adjusted to make several variations), and a pinwheel that really works! In the bottom right is a little person ( although the arms haven’t shown up so well in this photo) sitting at a table. With low legs and winter’s chill in the air, I’m imagining that it’s a cozy kotatsu! 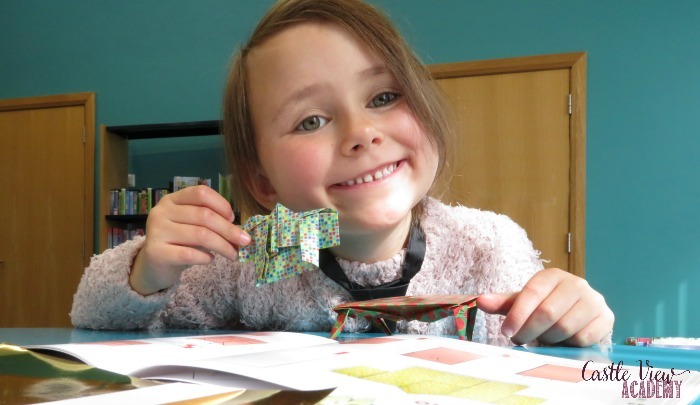 She has created several cards (there were more, but she gave some to new neighbours, friends, and family), and she wants to sell them to make some money! She came up with the idea all on her own and is determined. It’s her first business, and I wish her luck. So if you’d like to purchase a Kallista original in one of these designs, or any other, please let me know and we’ll work something out! 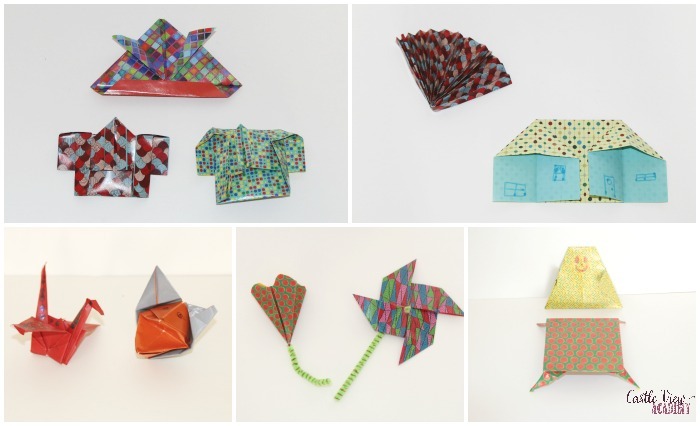 Both the Fun and Easy Origami Kit and the Complete Origami Kit are generally quite easy and there are lots of projects for complete beginners, and some scope for growth with some projects for those who have a little previous origami experience. 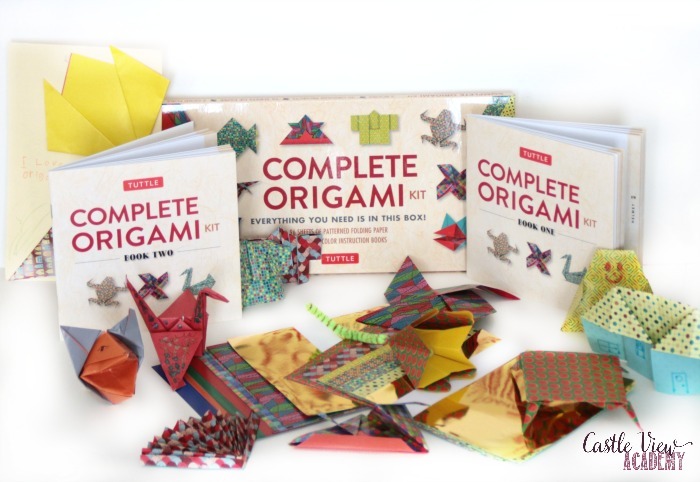 So if you’re looking for something to occupy your children, a gift, or an opportunity for them to create their own business…then have a look at these fun origami kits! « Canadian History, Writing, And Public Speaking: All In One!